Problem with dust in your home? As a business owner, the cleanliness of your organization speaks volumes about your professionalism. Not only this, but a clean environment is a healthy one, and it’s never been a more important time to protect employee well-being. Happy staff are productive staff, who are motivated to fulfill their daily objectives. If your business has a warehouse or manufacturing plant, dirt and debris will regularly collect in your air ducts. When not attended to, dirt and debris can resurface and cause problems among staff members. Though everyone won’t be visibly affected by the recirculation of debris and dust, you’ll never truly understand the internal impact of breathing this in. To maintain a sparkling clean work environment, a professional air duct cleaning service is highly recommended. We can be hired to inspect and clean your air ducts regularly, which creates a practically safe workspace, while creating peace of mind. Wow, What a Clean Office! 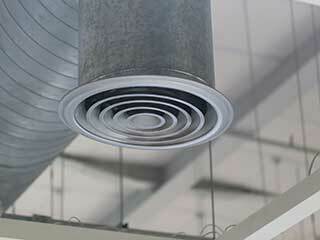 Air ducts are difficult to access, and therefore often neglected. Specialists can get to those hard to reach areas, removing the dirt and debris obstructing your air ducts. Once removed, you’ll be surprised by how much cleaner your office is. I Can’t Smell That Troublesome Odor Anymore! Reoccurring odors aren’t conducive to a professional environment. There are multiple causes to be addressed, from chemicals to dirt. A professional will extract the cause of foul odors, creating a fresh smelling workspace. Is It Me or Have My Allergies Died Down? Airborne objects can trigger allergies, and even cause asthma attacks. Routine cleaning will remove any dirt or pollen that’s wreaking havoc, reducing the chance of it being dispersed back into the atmosphere. Thank God Those Bugs Have Been Removed! Pesky critters love visiting your air ducts, and though you can’t always see them, the chances are they’re there. Unfortunately, an accumulation of dead bugs can restrict air flow, while contributing to the foul odors previously mentioned. Routine cleanings will help you safeguard against these circumstances, so is definitely recommended. Stains can be created from dirt which settles on your walls, carpet, and upholstery. With a dirty filter, your air ducts can recirculate troublesome dirt, creating an aesthetically distasteful environment. With professional help, your office will be clean and contaminant-free. Hopefully you have found this article informative. If you’re intrigued by the benefits mentioned, capitalize on the services of a professional today! 3 Reasons to Get Your Air Ducts Cleaned this Spring! Your air ducts work hard to bring you heat in the winter and cool air in the summer, something you might take for granted. However, they're also accumulating dust and other substances from their near-constant use. So, contact us today, and schedule a cleaning by professionals you can count on. Thank you for choosing our company! Feel free to browse our website for more information in the meantime. Our team at Air Duct Cleaning Agoura Hills is at your service any time!